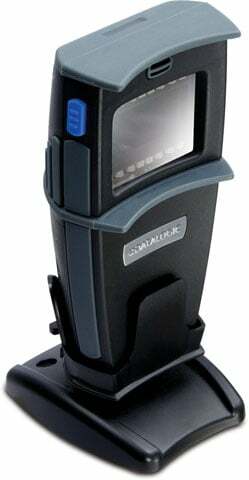 Datalogic Magellan 1400i - Scanner kit with RS-232 interface, DB9 12 ft. serial cable and US power supply. Color: black. The Magellan 1400i from Datalogic is an omnidirectional imaging scanner, which provides an aggressive imaging performance of 1100 digital scan lines per second. Its intuitive operation simplifies checker training and increases checkout speeds for improved customer service. The scanner is capable of auto-discriminating PDF417 and 1D barcodes, thus giving the user freedom to scan both normal items and ID cards totally hands-free. Magellan 1400i's ergonomic and practical design allows hands-free scanning options for small items and handheld scanning for bulkier items. Cable, RS-232 (Serial), DB-9 Female, Compatible with Magellan. Power supply for the Magellan 8500. The Datalogic MG140010-101-106R is also known as Data Logic	PSC-MG140010101106R	or MG140010101106R	.